Earlier this month I was in Dallas for A-Kon. 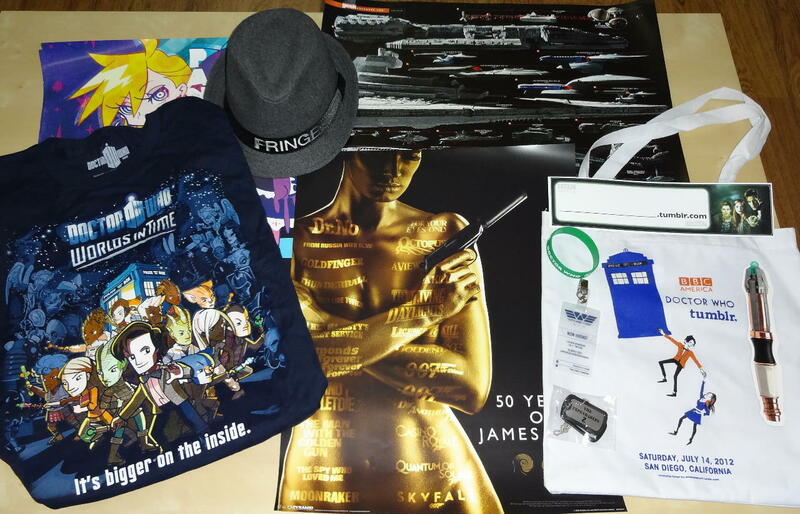 I’ve been going to this con ……. for a while. The past few years I haven’t really bought anything in the dealer’s room mainly because nothing screams out to me. This year was a little different. 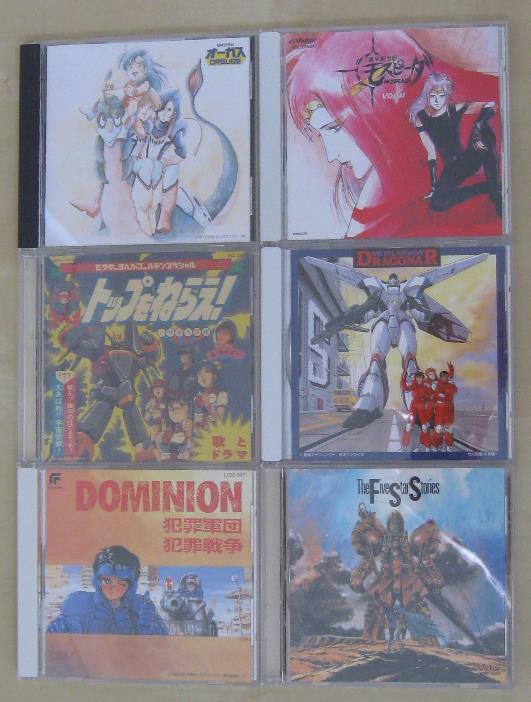 While making an obligatory pass though the room I spotted a table selling, among other things, a large number of old anime CDs from the 80’s and 90’s. They were used of course, but all appeared to be in great shape all things considered. 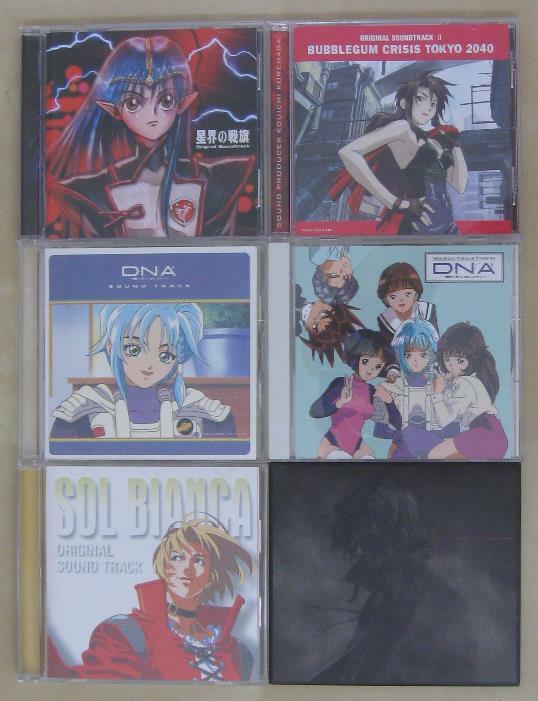 To my joyous surprise, I found amongst this lot a number of older CDs I had been looking for since I had actually sold off my copies way back in the early 90’s. The most notable of these were volume 3 and 4 of the ‘Anime Hot Wave’ series. 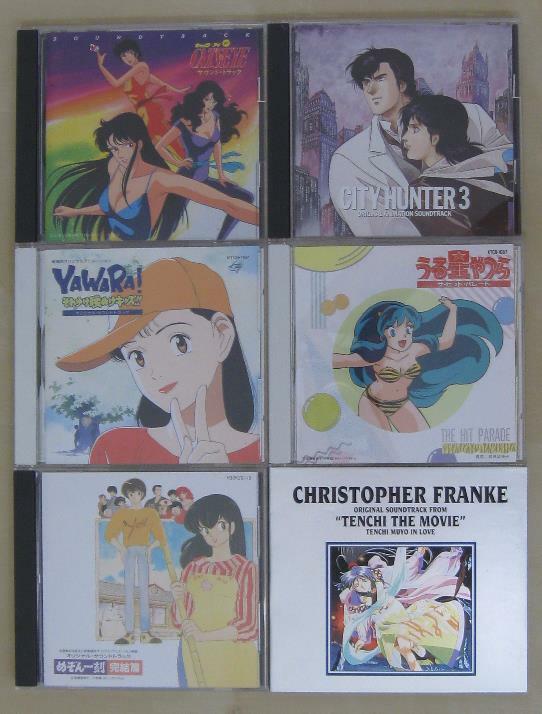 This was basically a compilation series of anime opening songs from the late 80’s and early 90’s. You can see the rest here, here and here. Now for the other shoe to drop. While I was grabbing up these treasures before anyone else could see what was there, I realized that there was a lot of older stuff so I asked the person working the table where the collection came from. He indicated that this was all from one person’s personal collection. A little surprised, I didn’t let my mind think it out before I asked why they were selling such an obviously great collection. The person at the table then informed me that the owner had recently died in a car accident. At that point I felt rather vulture-like as I held a couple dozen CDs in hand like I had just won the lotto. However after the fact it was brought to my attention that if it were me (who had died and whose collection was being sold off) wouldn’t I want my stuff to go to someone who would really treasure these items? I had to take a moment before realizing that yes that would be the case. Summary: Looking for that hard to find item? 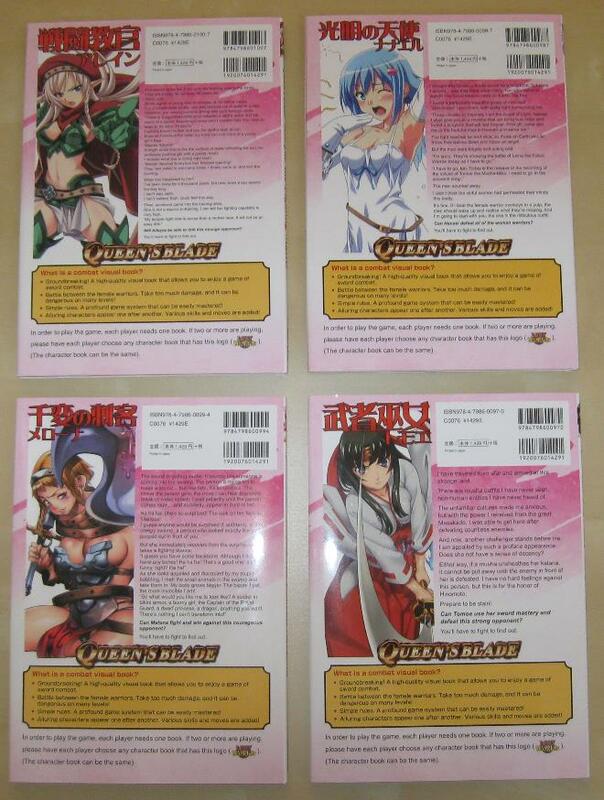 Questing for an out-of-print DVD or manga? 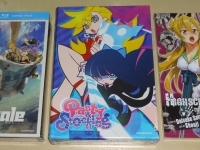 Look no further as we show some of the various different places, both on the web and off, that one can look for that anime treasure you have been seeking. Warning: this panel may be harmful to your wallet. Summary: Do you still maintain a laserdisc collection? Have more than one LD player? 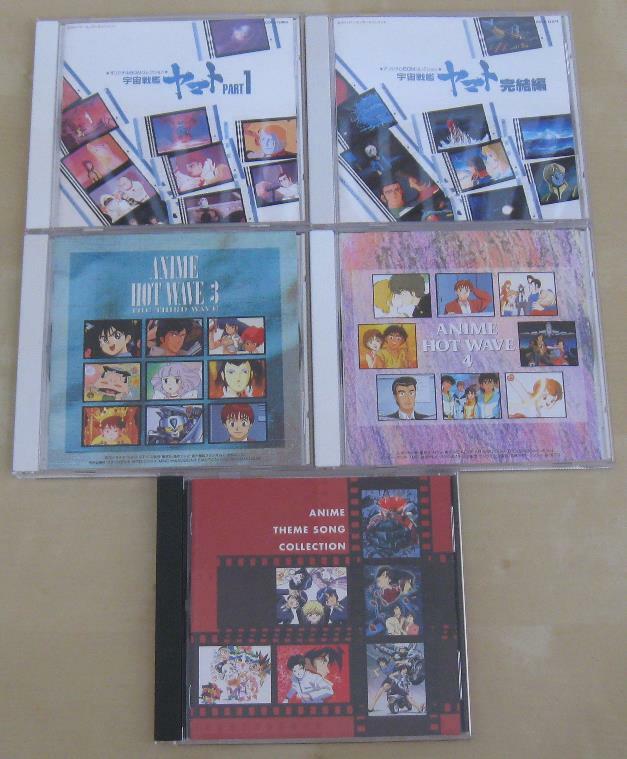 This round-table discussion focuses on the anime laserdisc collector and their collections. 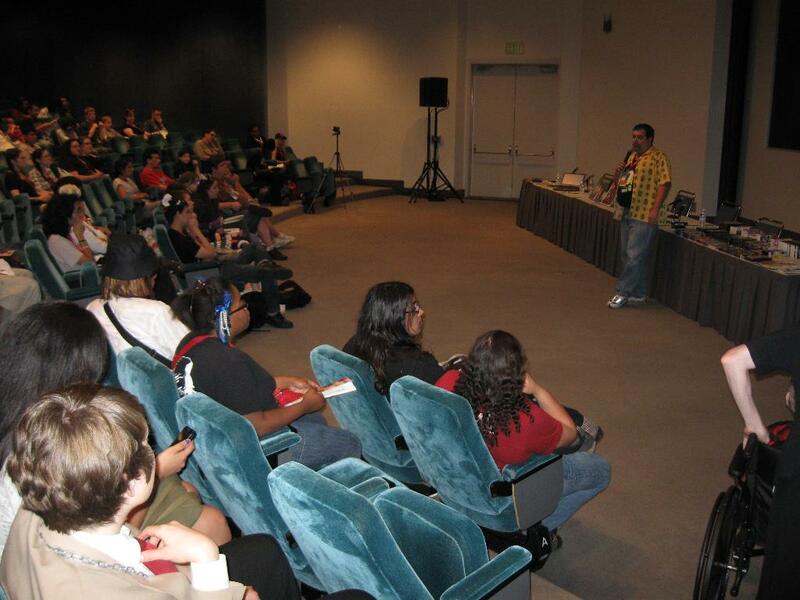 Anime Conji, running April 9-11, is a new anime con in the San Diego area. I will be hosting the ‘Anime Treasure Hunters’ panel on Friday (time TBA). This is a new panel for me. 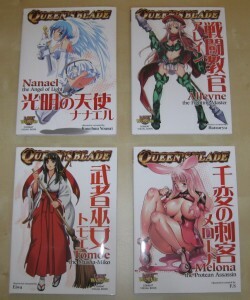 The concept is a guide on finding items one might consider treasures in the anime and manga world. While it is rather easy to find the latest ‘Bleach’ DVD, finding a copy of AnimEigo’s ‘Spirit of Wonder’ OVA is another story. This panel is not for those with weak hearts or weak wallets. There should also be some interesting parties at the con as well. So stop by if you’re in the area and check it out. 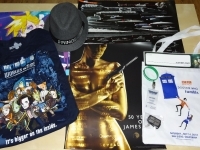 I have volunteered to work the Doctor Who convention Gallifrey One coming up next weekend at the LAX Marriott. I’ll be working for Martin, who also runs the Ops department for Anime Los Angeles. It’s a different gig for me since I have usually done more programming stuff. Mainly with the anime video room at Anime Los Angeles and a little bit at LosCon. Should be an interesting and knowledgeable experience however. ALA 6 was this past weekend at the LAX Marriott. It was almost a full week for me, arriving on-site on Wednesday for pre-day-zero set-up and leaving on Monday after final move-out. It was pretty fun with no major (really major that is) issues. Some problems of course, but all were handled in quick time. People do need to have a little more common sense and not walk down Century Blvd with their Airsoft guns out in the open. For my little part of the con, things went oddly smoothly. 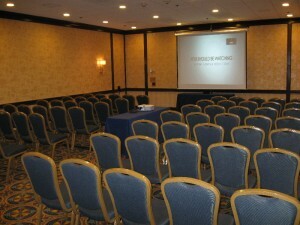 Got set-up in our room on Thursday afternoon. Tested everything and even showed a few things before closing up around 10 PM. Opened up Friday morning and while we did have a minor problem with one of the DVD players, it was easily resolved since we had back-ups. We started on-time at 9 AM and ran until just after 3 AM late Friday (Early Saturday) night. Same went for Saturday. Sunday we ran until 4 PM and then cleared things up. Staying the extra night (Sunday night) was an extreme help as we were able to just pack up the video room and move things into our hotel room for the night. We then helped with the Tech dept. move-out and after that helped with Logistics load-out for the truck and POD. Thanks to whoever in Logistics ordered the pizza, that was a life-saver on Sunday night. Other then running a little over (5 minutes or so) on Sunday, we were pretty much exactly on schedule the whole weekend. Pretty cool as far as I’m concerned. 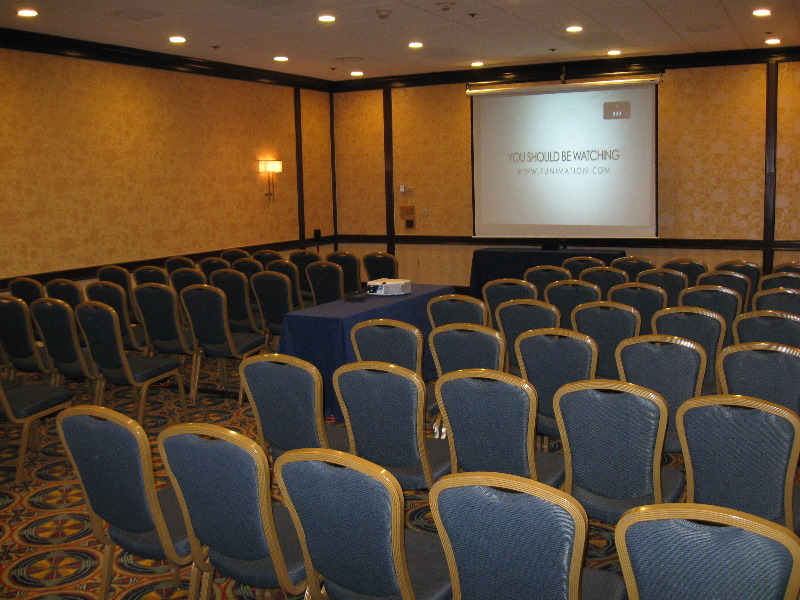 A very big thanks go to the folks who helped with the room this year (yay for having more then just two people!). Your help is very much appreciated as things would not have gone nearly as well with-out your help! 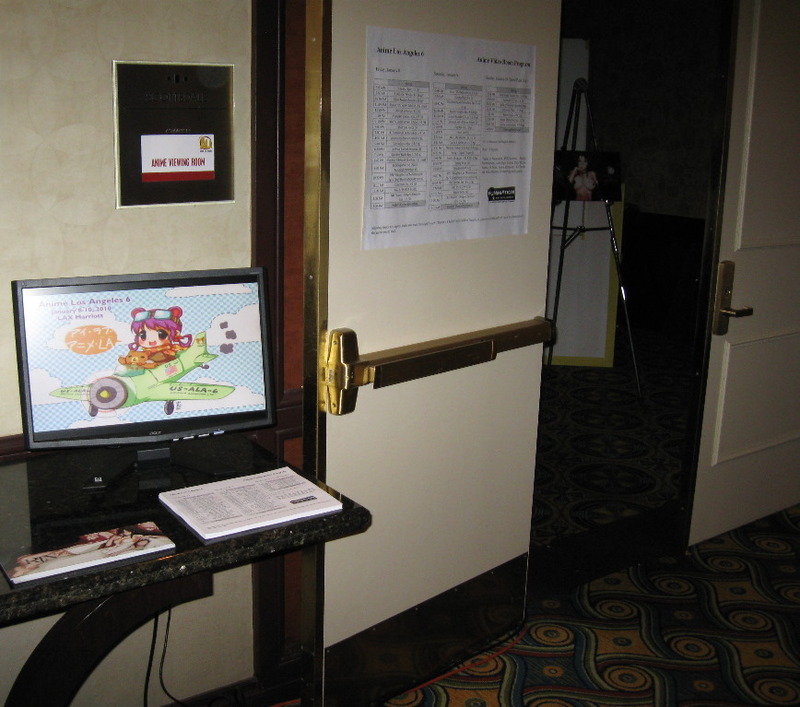 Here are a few pictures from the room including our slide-show monitor outside the room (showed ‘now playing’, ‘coming next’, etc. slides outside the room for people to see as they walked by) as well as our Rin display (thanks to Funimation for the cool promo items). Planning for Anime Los Angeles 7 in 2011 begins in two weeks. Enjoy!! Just posting this here as well….because I can. 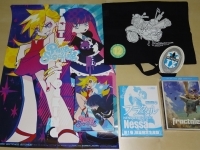 Thanks to Funimation, TRSI/Nozomi, Bandai Entertainment, AnimEigo, Central Park Media, Section 23 Films, Sentai Filmworks, Viz Media and Media Blasters for their help and support. Showing times are approximate and may run slightly over. 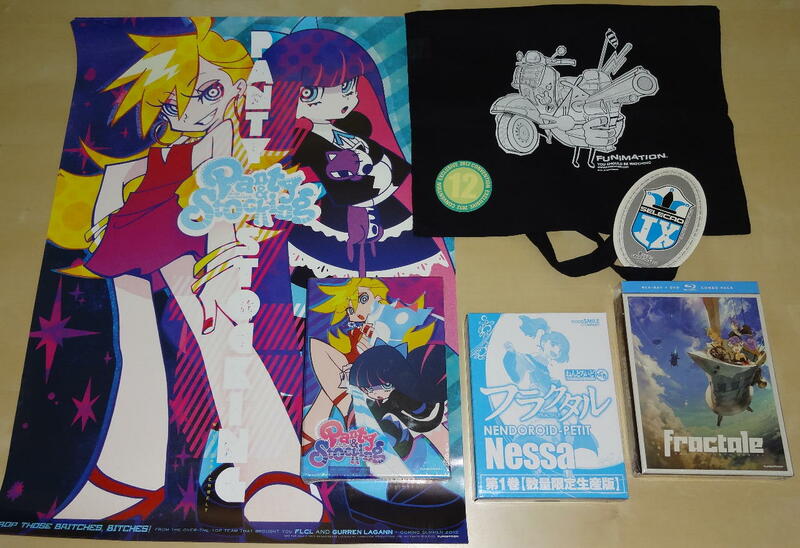 ‘Dealer’s Choice’ titles will be limited to what is available and will run at the discretion of the animé room staff. Animé Los Angeles 6 in conjunction with FUNimation Entertainment, present an advance screening of RIN ~ Daughters of Mnemosyne. The first two episodes of this groundbreaking 2008 OVA series will be shown in English prior to the January 19, 2010 DVD release. Episode one will screen on Friday, January 8, 2010. Episode two will screen on Saturday, January 9, 2010. Specific times will be available on the Animé Los Angeles website and in the program schedule available during the convention. The English language cast features Colleen Clickenbeard as Rin, Jamie Marchi as Mimi and Todd Haberkorn as Apos. Animé Los Angeles 6 will be held at the Los Angeles Airport Marriott during the weekend of January 8-10, 2010. The convention features a wide range of activities including live bands, gaming room, dealers hall, artist alley, karaoke room and of course our anime video program. Guests of Honor for 2010 include: “Bekka the Alice” (Becca Feiner), Fan Guest of Honor; Jessica Gaona, Artist Guest of Honor; The Spoony Bards, Music Guest of Honor and Kyle Hebert, Voice Actor Guest of Honor as well as Tadao Tomomatsu, Toastmaster. 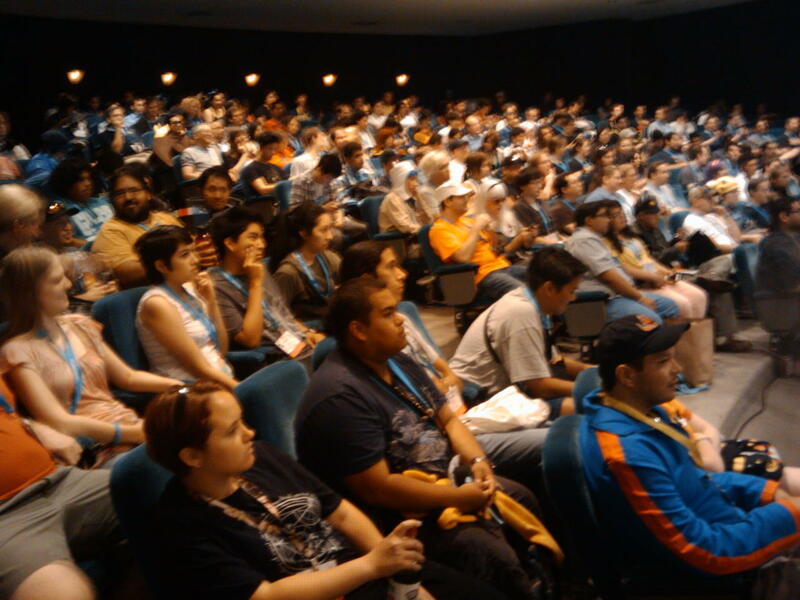 For further information on Animé Los Angeles, please visit www.animelosangeles.org. FUNimation® Entertainment, a wholly-owned subsidiary of Navarre Corporation, is the leading company for home video sales of Japanese animation in the United States. FUNimation has a proven formula for launching and advancing brands, and manages a full spectrum of rights for most of its brands including broadcasting, licensing, production, internet, and home video sales and distribution. For more information about FUNimation Entertainment and its brands, visit www.funimation.com.